It came as a surprise to me that growth in output per employee has all but come to a standstill in NZ. It looks like future generations are at risk of being poorer than the current one. An ex Reserve Bank colleague, who has focused on this issue for a long time, lays the blame mainly on a policy failure; specifically, too much reliance by successive governments on immigration to drive economic growth (and he isn't a NZ First member). Befitting Michael and I having initially learnt our analytical skills at the Reserve Bank, I adopted the approach the RB used to justify plans for massive increases in bank capital requirements to test the link between the NZ's failing productivity growth and migration (i.e. start with the desired conclusion and do superficial analysis to justify it). Ian, another ex RB colleague, has done serious work critiquing the RB's plans and draws parallels with Trump's justification for his policies. In a less serious report, Ian gives the RB lots of Pinocchio Awards in the form of Trump figurines. 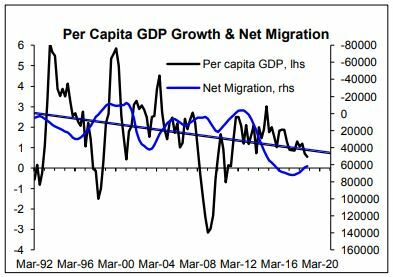 My RB-style analysis concludes that migration is the cause of NZ's fading economic performance. The obvious implication is that Kiwis leaving on a permanent basis are more productive than arriving immigrants. However, this doesn't mean immigrants are less productive than the Kiwis who remain. The only clear conclusion is that the Kiwis who leave are on average more productive than those who remain to enjoy NZ's great lifestyle. 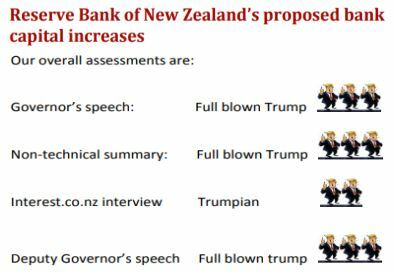 While it should be clear that this is a tongue-incheek Raving, the comments about the RB's plans for bank capital are serious while it is possible NZ is experiencing a "productivity" drain. Annual growth in the level of economic activity per person is highly variable due to economic growth and population growth being quite cyclical. Setting aside the variability, there has been a trend fall since the early-1990s (green linear trend line in the chart below). If the decline continues, by the early2030s growth in economic activity or income per person will be zero. In real world terms this implies that from around the early-2030s future generations won't have higher disposable incomes. This seems strange in an age of technology that promised so much but trend lines don't lie. They can be manipulated by selective use of the time period. But I haven't done this; the chart covers the full period data are available from Stats NZ. It is just a pity we are like a third world country and don't have data for earlier years. But it is much worse than this. 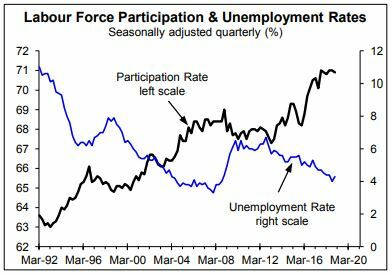 Since the early1990s the percent of the working age population engaged in work has increased from a low of 63% to a recent peak of 71% while the percent of the workforce that is unemployment has fallen from 11% to 4% (chart below). This should have boosted growth in GDP/income per person/capita. More revealing is what has happened to growth in GDP per person employed (next chart). 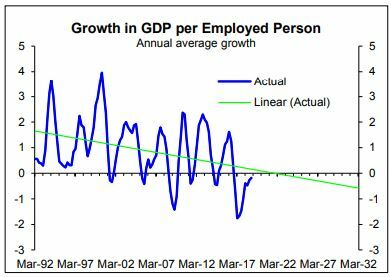 It is even more volatile even after using the annual average but the trend line says we have almost reached the stage - setting aside the extreme volatility - of no growth in GDP per person employed. It appears that future generations are already screwed. Despite a larger percent of the population working and less drain on the system from unemployed people the economy has largely stopped growing economic activity per person employed. I'm not an expert in this area but an ex-colleague from my days at the Reserve Bank - Michael Reddell - looks at this issue much more than me. This link is to Michael's most recent related blog that points out that being ranked high for ease of doing business hasn't stopped NZ from performing poorly in terms of economic growth per capita and he partly links this to our liberal immigration policies. The following is the conclusion from a 2013 paper Michael wrote titled "Why New Zealand languishes" that can be accessed here. The second link below is to another related paper, but Michael has written more recent blogs on the issue. There is no reason why NZ productivity and incomes should not once again be among the upper half of the OECD grouping. But it won’t just happen. We aren’t the victims of external circumstances, and we can’t count on external events restoring our erstwhile glory. New Zealand policymakers - well-intentioned always - have to take most of the responsibility for our continued decline. And here I would include those of the Douglas-Richardson strand, in some ways, as well as those of the Savage-Nash-Sutch strand, - and, of course, the majority who failed to do anything much at all (perhaps at least paying heed to Popper, on the merits of the piecemeal) In a very small country, which prospered for a long time, it seems that the idea of a strongly rising population as a normal and desirable feature took hold, even when the underpinnings that would have made such an approach sensible were no longer (or, perhaps, not for now) present. I don't always agree with Michael, but on matters like what drives long-term growth and much more he is much better read than me. I'm a bit Buddhist on this matter (i.e. knowledge isn't the same thing as understanding or wisdom, which saves me doing lots of reading). Michael and I initially developed our analytical skills at the Reserve Bank. Befitting that, I've decided to use the approach the Reserve Bank used recently to justify plans for dramatically high bank capital levels as the basis of my search for what is behind NZ's faltering output growth per worker. Local banks aren't saying a lot publically about the planned huge increase in capital requirements. One international bank has come out strongly against them while another supports them. Michael Reddell has had plenty to say about the plan, none of it good; and that is from someone without a vested interest in the matter (examples of Michael's reservations). Along with Michael, I think the views of another former senior Reserve Banker, Ian Harrison, who worked in bank supervision, should be taken seriously. Michael's summary of Ian's conclusions can be assessed here from which you can access Ian's 50-page report. As well as the seriously-researched 50-page report, Ian released an amusing 18-page summary that included the Pinocchio Awards like those below (link below to access the report). One Trump equals one Pinocchio; the link is telling porkies. Ian also tells a great story about the merits of driving oneself home after running a marathon; the New York marathon I think it was. As Michael and Ian have pointed out, one of the technical papers produced by the RB to justify humongous increases in bank capital requirements wasn't written until after the recommendation; it seemed to be an afterthought to justify what the RB and it would seem especially the governor wanted to do irrespective of whether it was well-founded. Ian's analysis suggests it is ill founded and will pose unneeded costs on people. My suspicion is that the plan is designed foremost to make the job of the RB and governor stress free. Another fun read if you aren't yet convinced that the RB will make recommendations based on a whim is Michael's blog titled, "An unserious organisation, with serious consequences". Befitting the RB's approach to assessing the best level of capital for banks I've decided to start my search for the causes of NZ's fading income growth per worker from the conclusion. Michael points the finger as NZ's excess reliance on immigration that he believes is at the expense of the productivity growth needed to boost output per worker. When you already know the answer doing lots of research is a waste of time. As shown in the chart below, repeated from page 2, growth in NZ GDP per person is on a sad decline. 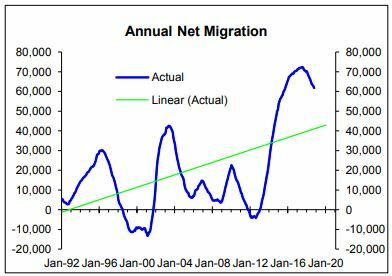 As the second chart below shows, NZ's net migration (i.e. the net inflow of people from overseas) has experienced a trend increase over the same period. Now for the coupe-de-grace: the two together on the same chart with net migration inverted and the trend lines almost completely match. Research completed, expectations confirmed; so all that is needed is a bit of verbiage to explain why there is an undebatable link between migration and NZ's fading productivity growth. NZ is clearly suffering from a "brain" drain or, more correctly a "productivity" drain. People who leave are on average more productive than those who arrive and stay. There is probably something in this rather it just reflecting preordained anti-immigration views. Personally I'm pro-immigration because I like the diversity of food it brings; what better reason could there be than that?! However, while it suggests people who come to NZ aren't as productive as those who leave, it isn't clear that the people arriving are less productive than the average person who stays in NZ. It could be that despite all NZ's attractions, a higher percent of harder working Kiwis opt to leave and reap the rewards of higher incomes and greater opportunity to make it in the big-time overseas; while people who value taking it easy are more inclined to stay. People who come to NZ aren't necessarily more or less productive than those who stay, but they are "clearly" on average less productive than the Kiwis who leave permanently. As an aside, the above migration chart uses the old migration numbers before they were irretrievably harmed by the dumping of departure cards in November 2018 (thanks Jacinda!). Here are links (here and here) to read my bitching about the new estimated migration numbers that I suggest people treat with the disdain they deserve (the numbers that is!). Is it the immigration itself or is the capital inflow that comes with it? My favoured idea is that NZ suffers from excessive capital inflow. This pushes up the exchange rate and thus reduces profitability in the export and import substituting sectors, thus throttling their ability to grow. The idea is based on Michael Pettis's work, based on double entry bookkeeping and accounting identities. Excess capital inflow comes with foreign non resident investment, new resident investment, and borrowing at low interest rates funded from overseas by the Aussie banks. Nearly all of it flows into existing residential housing with very little increase in productivity. The effect on productivity could well be negative. Policy makes it all worse by disincentivising saving with low interest rates, and encouraging non productive speculation in existing assets rather than investment in productive assets. We encourage unproductive investment rather than productive enterprise, develop a reliance on immigration and inflows to prop numbers up, and wonder why we get asset bubbles and underinvestment in productive business. I came with almost $1m 16 years ago and used it to buy property. I've had doubts about the benefits to NZ of immigration for a long while and that includes myself; obviously it is great for the immigrant (how many leave?). If the problem was capital then stop all immigration except refugees? Don't think that would work - the Lebanon and Jordan didn't get productive when millions of Syrian refugees arrived. Even illegal immigrants spend a fortune trying to get to a developed country and so do most of our international students so the obvious conclusion is make the immigrant pay - say $50,000 for a residency visa. I do remember my own application for residency visa in 2003 - the point count said I needed $200,000 - I almost fell over with shock to discover I only had to have it in the bank and I didn't have to give a cent to the govt. That $200,000 became an investment property. The correlation looks great, the causation narrative is debatable. Individual productivity is only partly an innate quality of the individual and its probably not even the big part (lazy stupid man with digger beats hard-working innovative man with shovel). But a steady supply of cheap labour encourages lazy management based on that cheap labour rather than clever management based on effective capital investment to improve labour productivity. When a large and growing section of the economy is low-wage there will be plenty of political lobbying to keep it that way. Which is where I think we are now. I do agree that higher-productivity individuals might then prefer to be somewhere else! New Zealanders can work really hard but are poor at retaining the benefit. Look at Southland which had and economic development plan that really had nothing more in it than a population increase of 10K. (say 10%). No idea of how to gain any benefit from it or what to do next. Queenstown (formerly a great place) Demonstrates big is worse and the inhabitants are poorer. If we had high-pay immigration NZ might become more productive. But predominately we have low-paid immigrants and that discourages training Kiwis, it holds low wages down which discourages business automation and serious research & development. The govt says we have 'skilled' immigrants but their skills are baking, bus driving, chef, tourist guiding, managing small shops and for each so called 'skilled' immigrant we have three who are not identifiably skilled (refugees and family members). Our cynical politicians talk about 'essential skills' but are really looking for cheap restaurants, care-givers for their elderly and occupants for their investment properties. If that analysis is wrong I can't find any evidence to prove it - it only needs a link between visa and IRD annual returns. 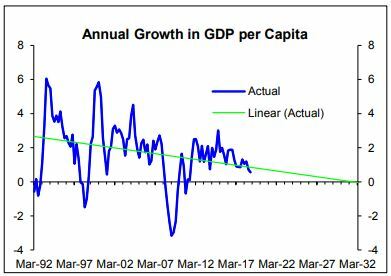 All GDP growth and all productivity growth has to come to a halt at some stage. If they taught you otherwise, Rodney, ask for your money back. Physics-types like me (studiers of energy and work and efficiencies) could have told you as far back as 1970 that the halcyon years were behind us. The comment above about a lazy man on a digger, is right on the money. With labour being less than 1% of work done globally, it essentially doesn't count. That leaves getting more efficient with fossil energy, which is a short-term fix, and trying for as efficient a use as possible of renewables. But that morph will do your graphs no help at all - quite the opposite. Your link is ten years old. Somewhere I read the latest projection is 11 billion not 9. Instinctively I distrust depending on future technology but there is a possibility that nuclear fusion will arrive (it has been imminent for 50 years now but then so was computer vision and now cheap computers can search giant photo archives and highlight your face probably better than you can do it yourself but do it instantly). If it does about half of your serious problem goes away. You have a good point about labour being <1% of work; it means we no longer need to spread people evenly across the planet. Even as our population grows rural NZ is depopulating and doing so fast. Parts of Northern Japan are going back to wilderness and two-thirds of Russia’s villages have disappeared or soon will. Humans are migrating like lemmings into giant cities. Immigrants despite all govt persuasion end up in Auckland (unless they move on to Sydney or Hong Kong).